Child Welfare Committee(CWC) and labour departments officer Lee Ete with help of Naharlagun police the team of child line Itanagar Unit rescued a minor child from D- sector Naharlagun on 2nd September last. Who had been kept for child labour. The child had been identified as Joti Chetry around 9 years old, daughter of Babu chetry and Rita chetry of Karbi Anglong of Assam. As per source from child line Itanagar inform that, after receiving complain from unknown person about child, the child line Itanagar had inform to CWC, labour officer and Naharlagaun police and following the information of unknown person police and child line team reached the commercial Apartment room no -3 of D- sector ,Naharlagun, where the team found that child had been tied with Iron wall in front of room. 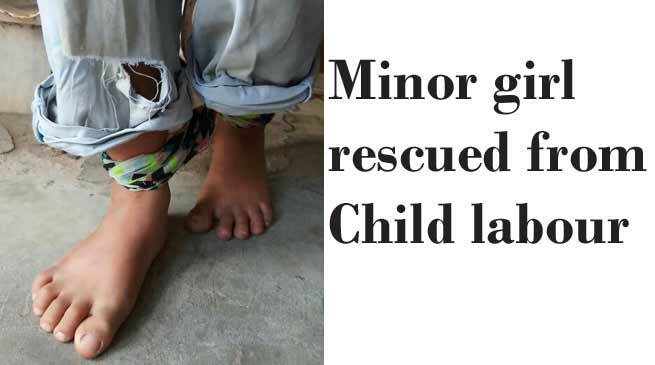 Officers from child line also inform that as per statement the child had been brought by some unknown women in Naharlagun and left her a house of an Advocate, where she helping her master in many household work and she had been beaten, tied by her employer by accusing stolen money from her master or employer. The child have been rescued and placed to Oju welfare mission here for reconciliation and to handover to relatives.